The other benefit to Swipe Surge users? You can swipe and match in real time instead of waiting around – which means you can start messaging or even meeting your matches right away. Swipe Surge is intended to create more app stickiness by gamifying dating, something Tinder has been incredibly successful at achieving. By enticing users to continually check in to the app to see if a surge is going on, and to keep them swiping on the app while the surge is happening, means users spend more time on the app than they normally would. This doesn’t necessarily translate to more dates IRL, but if Tinder users want to see who around them might want to grab an impromptu drink, it could. According to an article in Wired, Tinder says that a number of variables can trigger a Swipe Surge, including instances when activity is two times more than the average activity between users on the app. Based on early findings, most Tinder Surges occur on Monday nights (after a weekend of bad dates, perhaps), though the company said they could happen any day depending on local happenings, like a festival or concert. Also, it varies according to city. New York for example might have Swipe Surges later in the evening compared to other cities. Tinder says that during a Swipe Surge, member activity can be up to 15x higher, which increases match-making potential by 250 percent, and speeds up your communication with a match by 33 percent. Match Group, the parent company who owns Tinder, is under increased pressure to innovate and perform since Facebook announced it would be debuting its own dating feature. So far, Facebook is testing its dating feature in Colombia, Thailand and Canada. On a recent conference call with investors, Match Group indicated that it would be branding its suite of dating apps to focus on strengths – and for Tinder, this means catering to a younger audience more interested in meeting new people than in forming long-term relationships. Swipe Surge seems to be an effort in this direction. Tinder hasn’t announced the U.S. cities in which this latest feature is being tested (currently on iOS only). 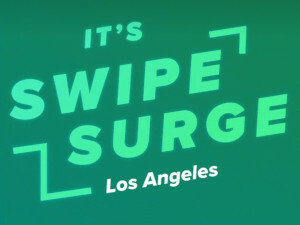 It has been reported that Swipe Surges have been happening in Los Angeles, New York and a few others. Ok once again another silly feature that no one asked for. Stop insisting we include or phone number to verify our accounts. As a company (match) has proven that they mis-use our information and cannot be trusted with personal identifiers like that. OKCupid which is owned by Match as well was selling personal info to third parties. And their main site was hacked for personal info. I dont trust them with any technically personal info and in my professional opinion as an engineer and qualified network admin you shouldnt either.